“Coherence can be described as a state of harmony, union, or connection. In the new energy and as a reference to the human being, Coherence has to do with a state in which the mind and the heart harmoniously flow together. Whether we are functioning as an individual, a community, or a group, the new energy is asking us to find balance between our thinking and our feeling. We can no longer rely solely on our analytical mind, nor can we just have our feelings guide the way. Every part of us has to come together in a harmonious, coherent state of being. Only then can we navigate these new energies to become multidimensional human beings that are in control of their reality. To be powerful manifestors, it is imperative to not only set clear intentions with our mind but to have our emotional state of being – with the heart as its center- in alignment as well. When mind and heart come together in perfect unison – when intention saturates every layer of our being, every cell of our body, and every thought in our minds – we become unstoppable creators of our own reality. 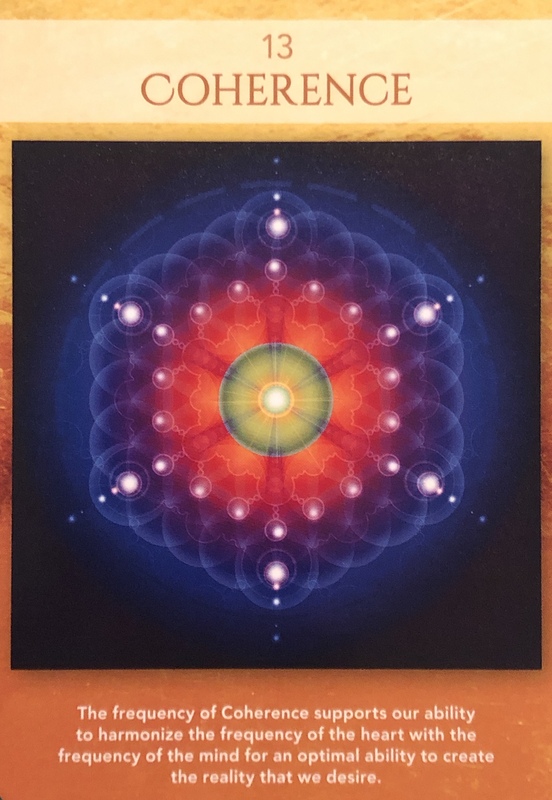 The basis of this Activation is the Flower of Life, representing the Universe as a whole as well as the grid on which all form-based manifestation occurs in this three-dimensional plane. All forms are harmoniously flowing together on this grid: whatever new form is created, whatever color is birthed, each has to find its balanced place within the whole of this reality. Conceptually, circles stand for everything and nothing at all, balance and infinity, purity and freedom. Try This: “Close your eyes for a moment and move your awareness to your heart. (This is also referred to as ‘dropping into your heart.’) Can you connect to the truth that is to be found there? Do you trust your heart? Coherence is a bringing together. It is finding the balance, the common ground. It is more about unity than compromise; an evening of the scales and a mutual respect and equality. Divine Feminine matching Divine Masculine, creation from a place of sacred respect and reverence. When we lead from the heart this is possible. When we are expansive and authentic, living in our absolute truth. When we open ourselves up, becoming a channel for love, light and transformative change, anything becomes possible. If things have become unbalanced in your life, you must first fix the balance from within. Our outer reality is simply a reflection of what is going on inside us. Where are you lacking balance and stability? Where have you let things slide? It is not too late to heal, even if things have been out of sync for a long period of time. Take some time in quiet contemplation and give yourself the time you need to bring your thoughts, feelings and intentions into alignment. Clarity is key. Use the image in the card above to activate Coherence in your life now.